Seems New York is the place to get your Gold Flake fix. Remember the $25,000 dessert?. Well while this isn't quite as expensive as that, it's still got the bling. It's got a Kobe beef patty, lots of black truffles, seared foie gras, aged Gruyere cheese, wild mushrooms and flecks of gold leaf on a brioche bun. Apparently for those special days where you've had a great day on Wall Street! 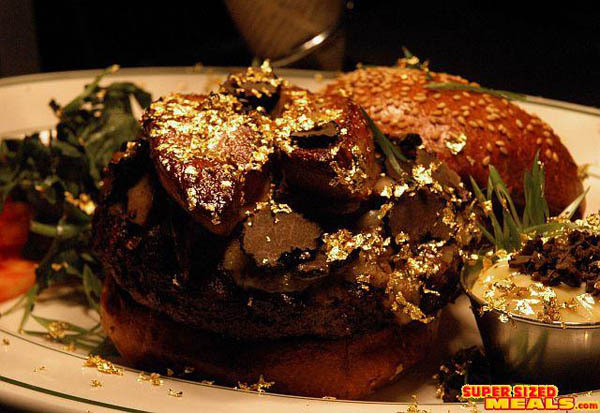 ITS creators admit it is the ultimate in decadence: a $US175 ($182) hamburger. The Wall Street Burger Shoppe just raised its price from $US150 to assure its designation as the costliest burger in the city as determined by Pocket Change, an online newsletter about the most expensive things in New York. "Wall Street has good days and bad days. We wanted to have the everyday burger (for $4) ... and then something special if you really have a good day on Wall Street," said co-owner Heather Tierney. The burger, created by chef and co-owner Kevin O'Connell, seeks to justify its price with a Kobe beef patty, lots of black truffles, seared foie gras, aged Gruyere cheese, wild mushrooms and flecks of gold leaf on a brioche bun. The eatery sells 20 or 25 per month in the fine dining room upstairs versus hundreds of $US4 burgers each day at the diner counter downstairs, Tierney said. Pocket Change previously designated the double truffle burger at Daniel Boulud's DB Bistro Moderne as the most expensive at $US120, and the Burger Shoppe set out to top that. Boulud's creation â€“ available only during black truffle season from December to March â€“ rose to $US150 this past season, so the Burger Shoppe raised its price on Monday to $US175. "Our burger is not about the price," said Georgette Farkas, a Boulud spokeswoman. "If you are making something concerned only about the price, you are off in the wrong direction." Without truffles, Boulud's burger costs $ US 32. It has a ground sirloin patty stuffed with red wine braised short ribs. O'Connell said the Burger Shoppe was "finding the ultimate expression of each one of the ingredients." "The concept was like a mushroom-bacon-Swiss cheese burger, which is my favourite sort of burger," he said. The burger comes with golden truffle mayonnaise, Belgian-style fries and a mixed greens and tomato salad. O'Connell pairs the dish with many fine wines, a lager or a toasted brown beer, or ginger ale.